Thread: C.O.W. - #106: Glacier Terror - Voting! Last edited by Fozzybar; January 17th, 2008 at 04:54 PM. An Antarctic evolutionary throwback, the 5m Tundramander, shares many physiological traits with its amphibian relatives. It may be a distant descendent from the Koolasuchas of Cretaceous Australia. Tundramander has the ability to regulate its own metabolism, allowing it to essentially shut itself down between meals. What appears to be a coat of scales are actually fleshy quills which are capable of secreting a thick mucus that encases and protects the animal as it freezes. Sensing warmth or increasing vibrations signals a more plentiful food supply and initiates a slow awakening. With the shifting of glaciers and tectonic plates, many of the few surviving Tundramanders have been awakened in a new era. Last edited by N D Hill; January 12th, 2008 at 08:50 AM. When planet X55-Benthula (later called The Second Earth) was inhabited in 3915 BC, the adventurous among men was instantly drawn to it. Once more there were great ranges of mountains to be scaled, and again one could venture into the depths of uncharted jungles. The problem was, which was soon discovered, the native creatures were making the escapades far more exciting than most men had ever hoped for. The adult Khan-Or lives in the higher altitudes of many Benthula ranges. It has the ability to freeze itself into a hibernating sleep, (usually clinging to the shadowy side of mountain peaks), and is in need of little food, once mature. Its supreme sense of smell alerts it to every scent and movement in the nearby mountains. When awake the Khan-Or warms up very fast by generating extreme heat inside belly. It has developed an interesting technique of hunting, by sliding down the mountainsides on its abdomen (often upon the comparatively even glaciers). This melts the top layer of glacier ice and gives the creature an incredible speed, which it can stop, if necessary, by flipping its feet downward and driving its sharp claws and tail into the ice. Last edited by Cloister; January 12th, 2008 at 02:12 PM. The crevasse worm's eggs are laid deep in glacial crevasses, and over decades, as the crevasse widens, the larvae grow, feeding on microorganisms and small fish. 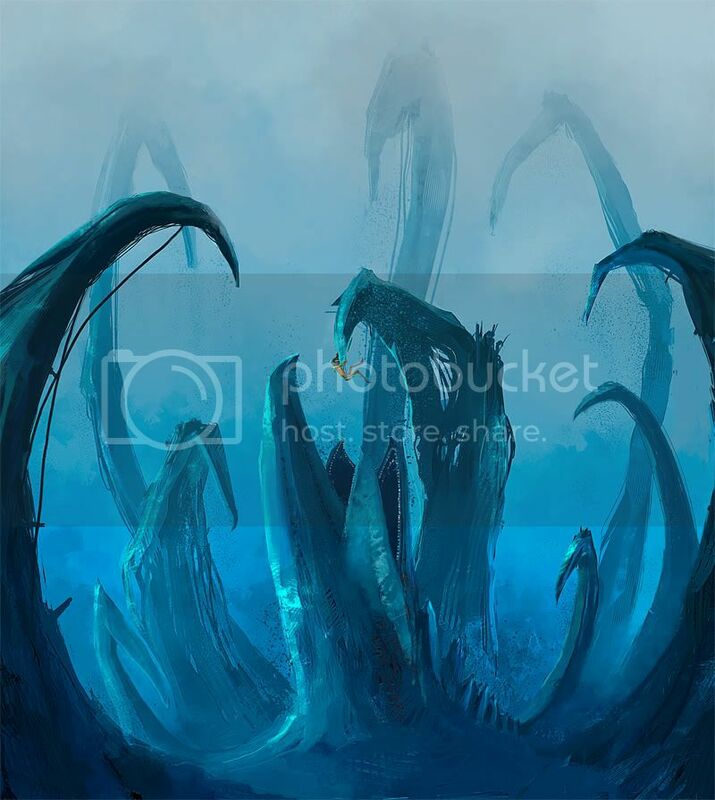 After several years, the creature's size necessitates larger prey, and for unfortunate explorers who may camp in the glacial territory of one of these beasts, it is another risk to consider for their expeditions. 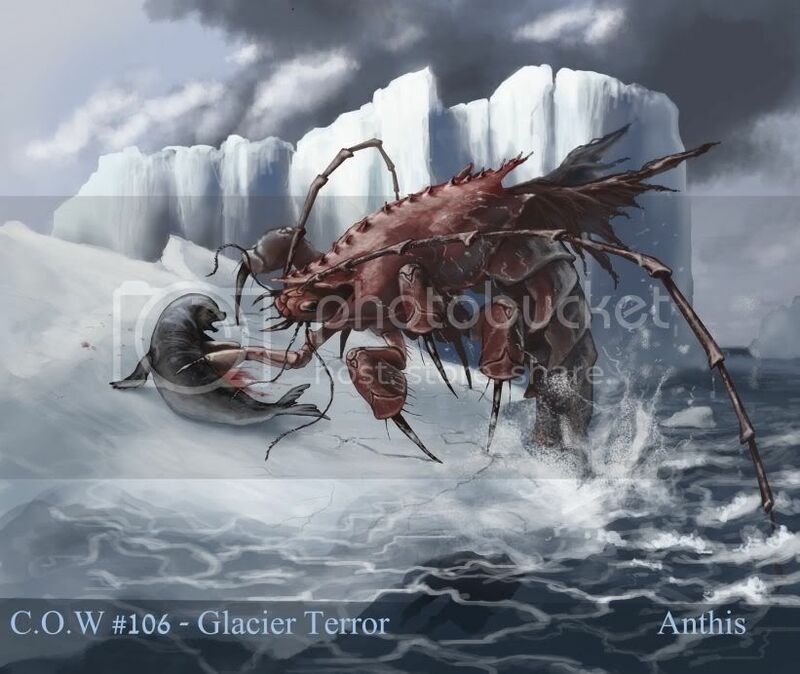 The Glacier Terror is a little know relative of the common earthworm. 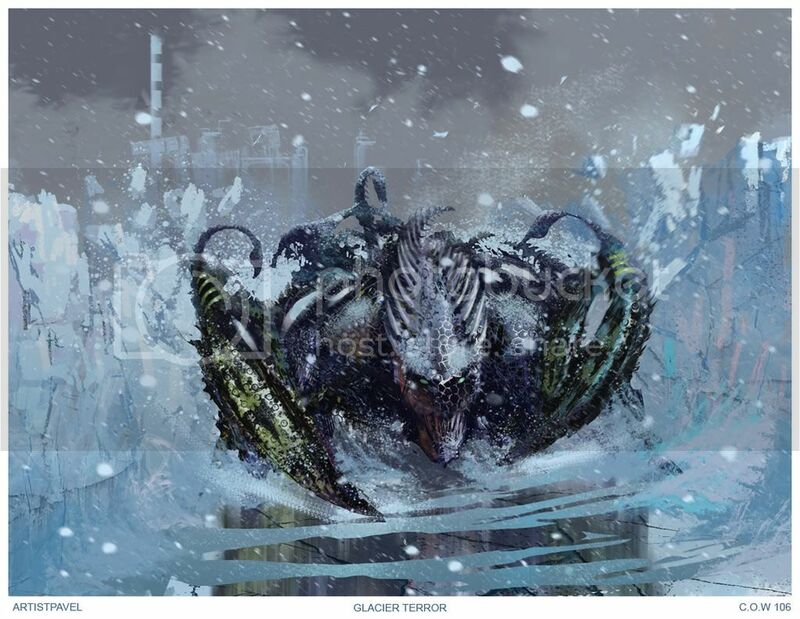 Living among the glaciers of the North Pole, the Glacier Terror uses his teeth filled tentacles to cut trough thick ice at incredible speeds. The attack of a Glacier Terror is totally unpredictable: usually his victims will only feel the earth shaking moments before the worm emerges. The Glacier Terror uses his quick spinning both to dig and to rip apart any opposition or menace he might find. His senses are focused on detecting heat sources. Since he feeds mainly of mammals, he uses his enhanced senses to feel the heat of their bodies hundreds of meters away. The Kryodon, a relative to the extinct sabretooth tigers, is a rare but extremely dangerous arctic predator. 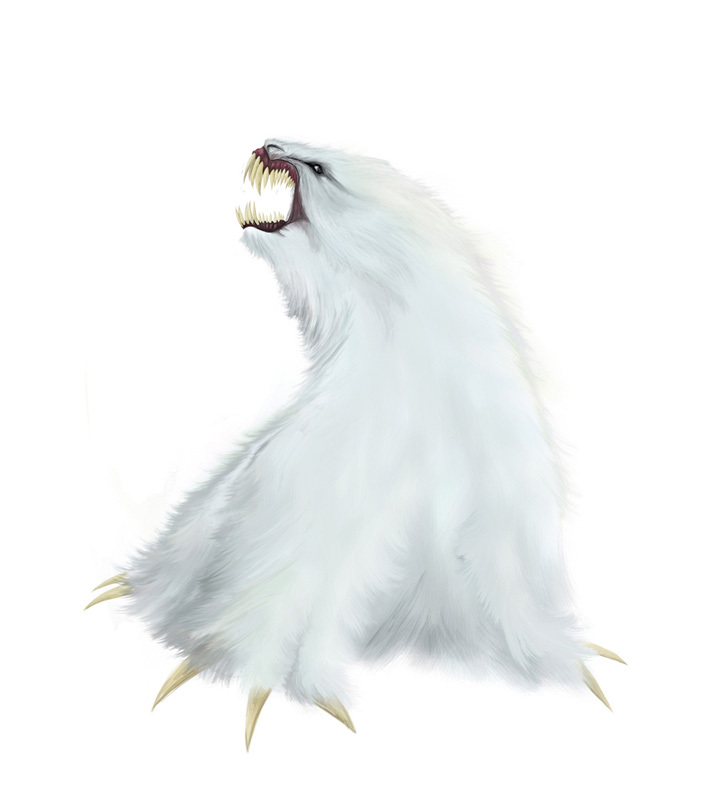 with it's massive claws and tusk-like teeth, it builds a lair in a crevasse to hibernate. When the ice melts and it becomes active, it preys upon any large animal it can find, not sparing humans who dare to enter its hunting ground. The stone dragons are tenacious scavengers which follow the movement of glaciers on the southern continents of Essowaire, particularly far south of the Dunassai emporium. They feed off the corpses of large herd beasts in the wake of the glaciers that descend the mountains. The head on the stone dragon’s right melts large portions of the ice away by spitting up molten acid, whilst the head to its left digests what is sometimes the only matter left behind after so long; bones and hair, inedible for the creature’s primary digestive system. The powerful fore claws are used to dig away at the ice and carcass, and the exposed belly is protected from the intense cold by thick plates. The extremely slow metabolism of these creatures restricts their speed and ability to hunt live prey, but allows them to hibernate for years at a time when there is no glacier movement, awaking to the vibration of the glacier beginning to slide once more. It is said in ancient legends that they were formed by detaching from the mountain tops themselves, and the appearance of one to a traveller is a terrible omen. 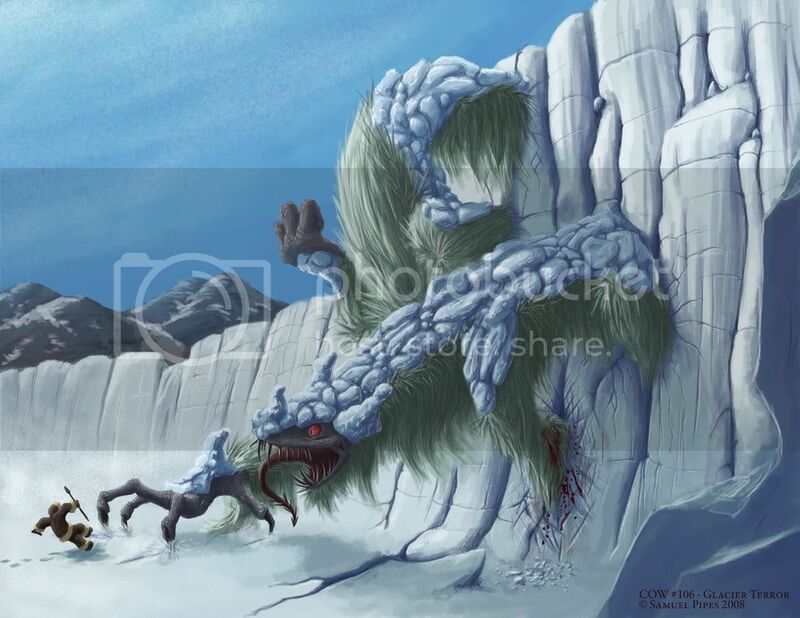 The Imiqqiq Atasqa (literally "Devouring Snow") is a massive, many-limbed predator that stalks the arctic and sub-arctic, laying partially buried in snow with the aid if its natural camouflage, waiting for prey to wander too close to escape. Prey for the Imiqqiq is scarce enough in summer, practically nonexistent in winter. Therefore the beast has evolved to hibernate in extreme colds, literally allowing itself to be consumed by the annual swell of glacial drift. They are freed again when the ice recedes, though this rarely frees it all at once. The half-frozen Imiqqiq's legendary patience evaporates as it waits to be freed, often clawing at the ice and injuring itself in a desire to speed the thawing process. Last edited by SPipes; January 17th, 2008 at 08:27 AM. The Northern Stu can travel quickly through the cravasses that riddle the glaciers of the highlands. With infrared sensors on its skull, the Stu can sense even the most distant heat source, leaving its prey no place to hide. Unlike the Southern Stu, the Nortnern Stu are adept swimmers. Alongside the ice chippers on deck, the rope bearers, and the brave (although quite foolish) lighting engineers, Philippe and his crew sought to bag the deadliest genetic mishap and thorn in their crabbing seasons side to haul back (in many pieces mind you) to their shores. Philippe’s bowels turned to water. He’d long grown his sea legs, but even the most seasoned fisherman wouldn’t be able to stand the conditions he faced now. His hands shook with the rise and fall of adrenaline and fear. “He will be disoriented once blinded, thrashing madly for an approximation of 10 minutes where then he may finally appear sedated.” the oceanic biologist explained before they set out on their expedition. “Then, and only then, can he be subdued and ultimately killed.” Special lights, of unknown wattages, were secured to the decks and masts of their boats. Their weight and clutter of wire did nothing to help the deck hands and navigators; even their trustworthy boats moaned beneath the additional burden-the heat they emitted even showed defiance to the biting cold. “Oh, I almost forgot. Whatever you do, make sure he is not cornered. I cannot say this enough!” The biologist fidgeted, obviously showing reservations. 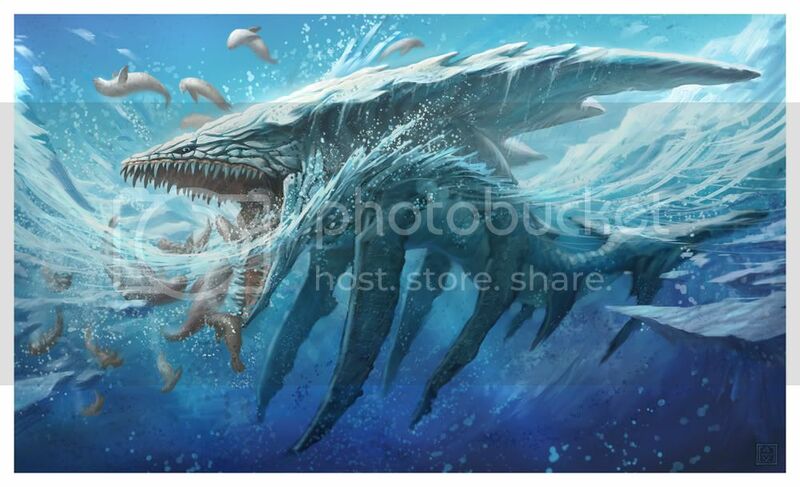 This huge beast first made an appearance when the new settlements near the huge glaciers of Antarctica was attacked. 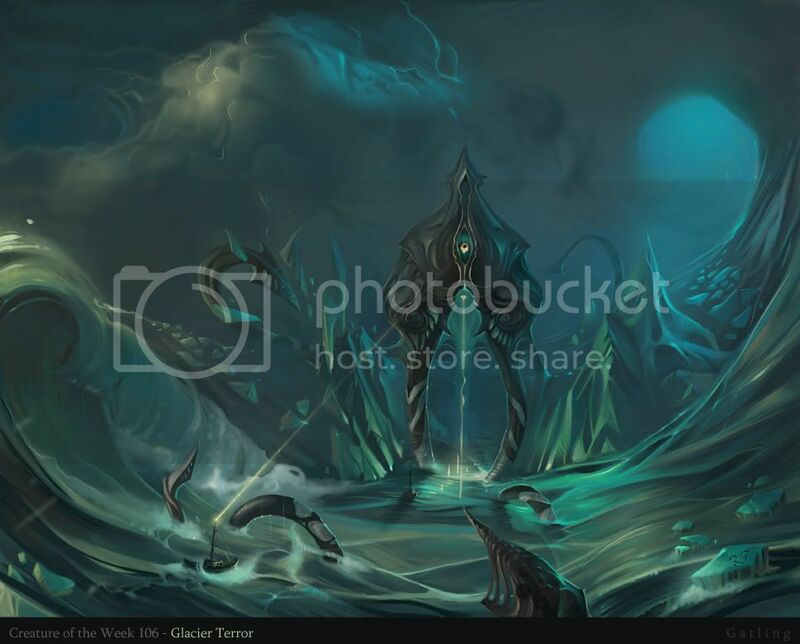 The speed of the attack had everyone confused as to what had actually happened, it was assumed the base had slid under the icemasses during a freak volcanic outburst. It was only when studied from observatory satelites that the true fate of the outpost was discovered. How to describe an animal so angry and vicious like the Giant Antarctic Mole? A Terror is definitely a good start, but other creatures have been called that, and all of them would certainly run scared at the mere sight of this abomination. 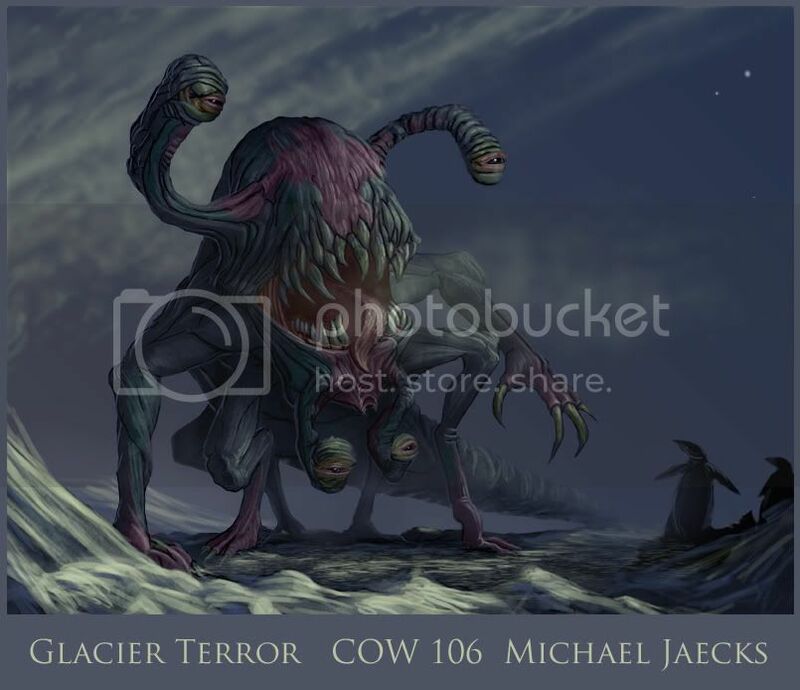 In my many years living in the Antarctic Continent (studying the formation of crevasses in the Lambert Glacier, the largest in the world), I have only heard about this legendary creature. The description is usually followed by a scary warning. Since I am not the alarmist type, and most of my readers will likely never set foot in the White Continent, never mind this Glacier, I'll spare you from that. A survivor of the Tertiary Period, The Giant Mole was not a Mole at all, but a Land Whale. The only remains of this animal ever found point to a species that countered the common flow of evolution: after millions of years in the water, this whale developed legs and returned back to dry land. Whales are not unfamiliar with movements like that, being originally land animals, but this further return to land makes no sense at all, since Antarctica was already icy and barren by then. There are many old reports of this creature attacking travelers. In fact, this animal seemed to be always violent towards everything that moved. Stories from survivors describe a dark shape sliding under the glacier ice, then emerging from a hidden crevasse to swallow people whole. The ferocity of the Giant Mole even created a somewhat anecdotal legend: The creature would have been exiled on land by the other whales a long time ago because of its violent behavior. As ludicrous as that sounds, some scientists believe that might not be that far from the truth: this particular species could have been pushed back to land due to competition with other, larger whales. Whatever is the reality about the giant Mole, we might never find out. The last reports about the creature were around WWII. As the exploration of the Antarctica goes on, we get more certain that this species is in fact extinct. Except that the lack of evidence keeps fueling its legend. Every time I hear the story, usually told by some drunk in the Antarctic Base Pub, it gets more and more exaggerated. It must be affecting me, because I had a nightmare last night. With crooked, sharp teeth it devoured the lower part of my body, but I could not feel anything because of the cold. As my legs cracked like ice slush, I learned the real meaning of frostbite. Today, i am sitting inside a huge crevasse to protect myself from the storm outside, and I can't stop thinking about it. I look at this perfect tunnel formation, full of scratch marks all over the walls, and I can't help but wonder if this is really a natural formation, or the work of busy talons looking for the next victim. Some marks look ancient but other not so much: my cold scientific logic disappears as paleolithic fears take over. The faint light of my lantern can barely illuminate my surroundings. The antediluvian ice cracks as the glacier moves inexorably towards the sea. The Giant Mole might be extinct, but in this dark, cold cave, the Terror is alive and well. Last edited by xgabo; January 16th, 2008 at 11:30 AM. Dwelling in the cold arctic exists a species of creatures known as the Fishski. The Fishski is a highly aggressive and suprisingly intelligent creature with an arctic style amphibious twist. Fishski dwell high up in the most elevated of glaciers and spend most of their time in the water. Occasionally the Fishski becomes ice bound and searches for prey outside of its aquatic chambers. The Fishski feeds off virtually anything available. The Fishski comes fully evolved with a powerful fish like tail used for swimming, a unique body structure that stores fat and shields the frigid temperatures, excellent hearing abilities, and a textured stomach to help grip the ice when not wishing to slide around. The Fishski depends on its hearing over its eye sight to sense danger. The sides of this creature reveal air sacks and small gills above that provide the Fishski with everything that it needs for it aquatic terror escapades. The Fishski also has powerful arms that help propel it and sharp boney fingers which dig deep into the ice allowing the creature to get leverage and pump itself similar to how a skateboarder uses their legs. Last but not least the Fishski has an oversized head used for devouring its prey practically whole and two different types of teeth. One set of teeth is used for scare tactics and stabbing into its victim and the other set is for bone and ice crunching. The Fishski chews with its molars as humans do and we can't forget the ski like legs that more or less define the creatures name. Last edited by Lege1; January 16th, 2008 at 11:51 AM. By the end of the twenty first century, humanity was forced to seek resources at other planets. One of the main difficulties, besides technical challenges and harsh climate, was confronting native live forms. Karkush running at full speed is capable of smashing masses of ice and can pose serious damage to human build extraction facilities and cause casualties among the staff. Last edited by Paul Dolgov; January 16th, 2008 at 11:20 AM. This member of the shark family lives in the arctic regions of the planet. It uses a large, air filled, snow white, cartilage crest attached to her skull that floats at the waters surface. It lies motionless near the edge of glaciers where it can use it's camoflage to blend in with the icebergs. The shark can slow its metabolism for extended periods allowing large pods of seals to gather on top of her crest...when enough prey is present the shark slowly raises it's pectoral fins, with a violent thrust she pushes her mass out of the water tilting her crest so prey falls towards the mouth. The percussive impact is enough to stun and disable most prey. This terror of the glaciers can decimate seal pods by 75% and has even been seen preying on Polar Bears and the occasional eskimo. Last edited by VegasMike; January 16th, 2008 at 06:33 PM. The "The messenger of King Bore" is not to be found in your ordinary pet shop dictionary. You will however find it next to "The adominable snowman and "The Serpents of the seas" in any book dealing with mythological creatures. It is known to be a creature of great proportions and strength from the tales of the eskimo people of Greenland. 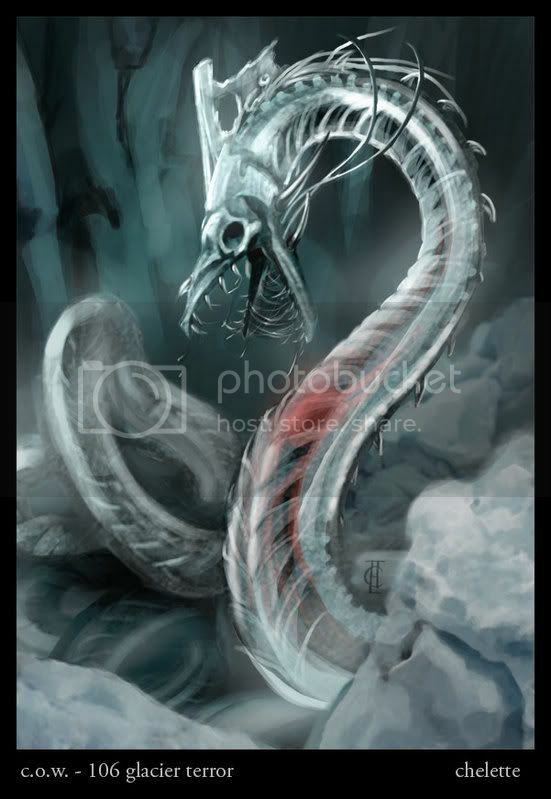 It dwells in the deep of the glacier only emerging to eat using the melt water tunnels and streams to move about. Last edited by Lander; January 17th, 2008 at 11:44 AM. 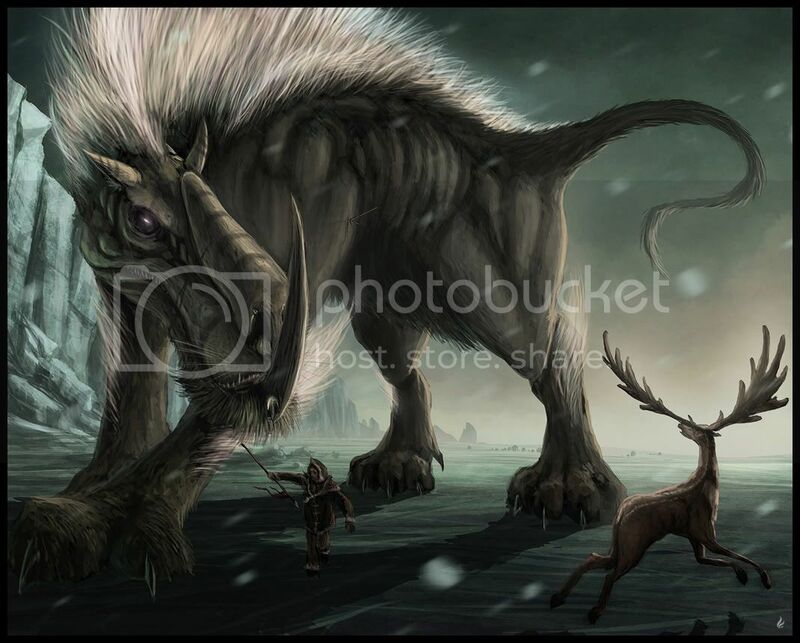 Woorthog was a gigantic prehistoric mammal which terrorised human during some period of Pleistocene. Bigger than mammoths, a great hunter, was able to eat every animal on the earth. If it saw the prey, there was no escape. 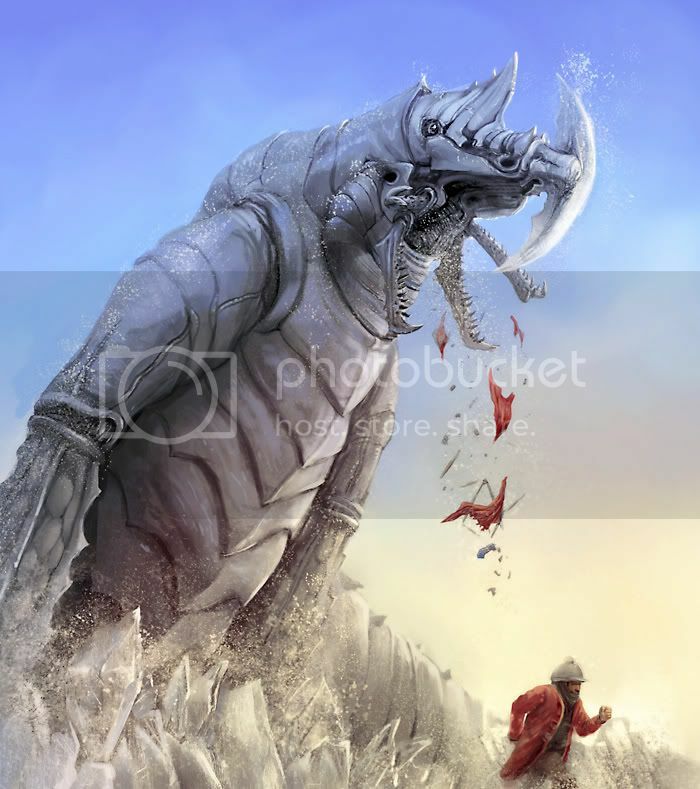 With it's tooth transformed into a horn, hunter could destroy not only human's settlement but also icebergs, and get into the frozen caves. After 300 years of its appearance every creature on the north pole area of our globe extincted, because of appetite of the beast. Scientists say that was kind of suicide for the Woorthog who also disappeared. Woorthog means in the prehistoric language The Wolf of Flame and some people suppose that it was an inspiration for the creators of Nordic mythology to make up the story about Fenrir. Last edited by Paul Kang; January 17th, 2008 at 11:10 AM. The Arctic Glutton can lie dormant for weeks at a time (accumilating much snow on it's broad back, which gives it camouflage) until prey comes along, which is snatches up with surprising speed. It's prey mostly consists of scavengers, which it attracts by secreting oils that smell like dead flesh from modified sweat glands. But whatever happens by it's clutches will become food; even entire herds of elk have been known to be eaten by these ravenous creatures. "The Ice Mal havoc are rarely seen by arctic and antarctic explorers, they are mostly heard or felt as they cause ice cracks and breaks in ice flows. 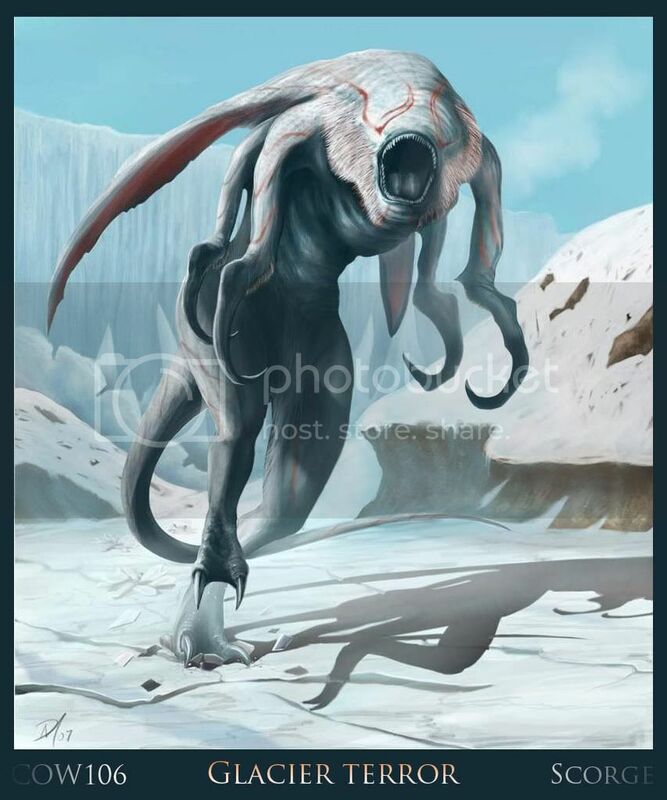 These seem to be the only encounters with these creatures, they cause havoc , fissures, avalanches, and anything else deadly and dangerous to anyone exploring in remote icy climates. Their origins and anything else about these deadly pests, is currently unknown . But any explorer that ventures out within these remote climes must be aware of the perils caused by these Ice Gremlins. Hopefully more information will come to light within the next decades , as the habitat that they call home continues to shrink." excerpt taken from Dr. Foens arctic explorers companion. Last edited by Azathoth; January 17th, 2008 at 05:17 AM. This large, polar dwelling arthropod is strictly carnivorous and feeds mainly on birds and mammals like seals. Due to its size and weight, its swimming speed is rather low. Instead, it lies in wait and uses an ambush strategy. Hiding itself submerged under the floating glacier ice, it will search for prey living above. Once located, it will crawl up from under the ice and hit the unsuspecting prey with its specialized mouth parts. The attack is planned carefully, as its running speed is low and there usually is no second chance. 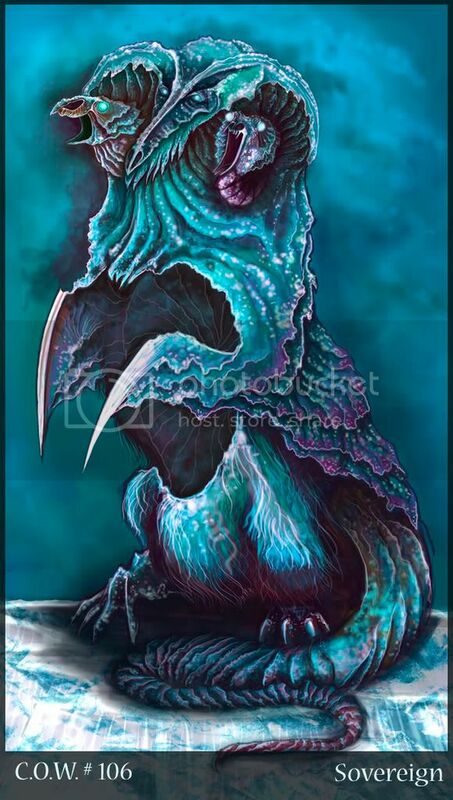 In early times, occasional human casualties have been reported, and added to its size and appearance, earned this creature its nickname "Glacier Terror". Modern scanning techniques nowadays prevent such accidents, as these creatures can now be easily located under the ice and thus avoided. Last edited by Anthis; January 17th, 2008 at 04:35 AM. One per glacier, that's the rule for these berserker beasties. So raw is their fury and so deadly their grasp(actually impaling), one sight of the charging brute and you know your goose is cooked. Born and abandonded in the warmer climates near the glacier areas, the Red Bearded Snow Angel starts life learning the hard way what it is to be alone and desperate. By the time it reaches adulthood and has migrated into what will become its icy home for the next few decades, it's unholy rage and instinctual killing mindset is honed in the icy wastes of the glaciers of the world. With hooks for climbing sheer icy cliffs, and talons that have over the course of evolution merged to become two doubly strong appendages, the Snow Angel is right at home in the unforgiving landscape. In the glacier fields surrounding Azemohre's castle live the Ice Trolls. They are Vicious fiends that lurk in the maze of crevices surrounding the castle waiting to attack any intruders. No one knows exactly where Azemohre acquired the beasts, but it is rumored they hail from the frozen wastes across the Thuldarian sea. Standing from 10 to 12 feet high they are only vulnerable to heat spells, and attacks by crushing weapons such as maces or hammers. Edged weapons tend to do nothing more than chip small pieces out of their hides, and may even get stuck and wrenched from the wielders hands. Last edited by jfwalls; January 17th, 2008 at 03:35 AM. Recently discovered in the artic wasteland. 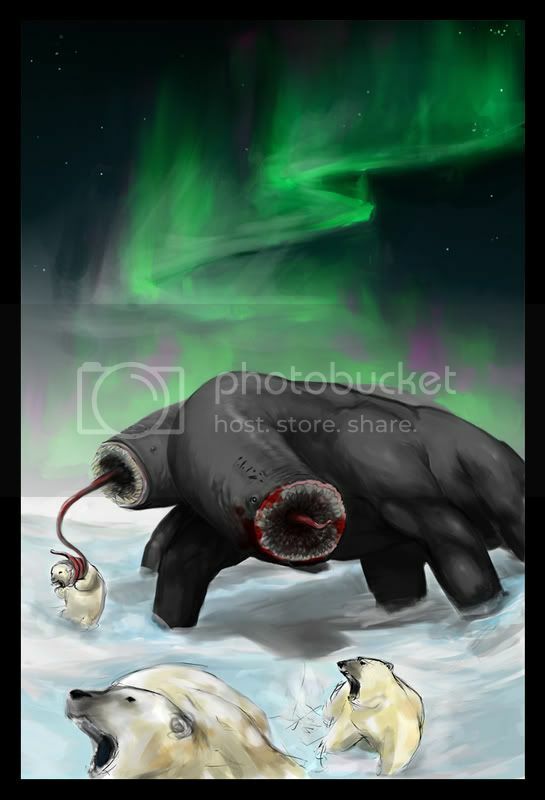 A gigantic semiacuatic mammal, the Baryorosmarus uses their claws to break trought the ice in order to hunt their preys: polar bear, and small whales. They usually live in couple for all life. Last edited by Samolo; January 17th, 2008 at 03:17 AM. Found deep in underground glacier caverns, some speculate it is a creature from the ice ages adapted to the extreme weather conditions by actually assimilating its surroundings. It is able to hibernate for long periods of time, however it seems the longer it hibernates, the more flesh is replaced by ice. The oldest specimens are simply bone, ice as flesh, and a dimly glowing heart encased in its icy chest. In this condition the body actually amplifies the sound of the heart to a sub-bass level one can feel deep inside themselves. Last edited by Michael Jaecks; January 17th, 2008 at 11:22 AM. Render the whole body in the same quality as you did it on the face and your entry is in next time There is just a too big gap in details and quality between the head and the body (and rest of the image). Please, show the whole body or at least a major part of the creatures body, so the anatomy or design can be spotted. Still i accept your entry...it has some depth which i like...but next time you need to come up with a working shape and design. jfwalls: you got my vote. Simply cos it's terrifying. And it has me in it's sight. Next in line would be Apocalypse_Rex but it looks kind of oblivious to our presence. C.O.W. #220 ,Furious Tiny Terror. Voting!